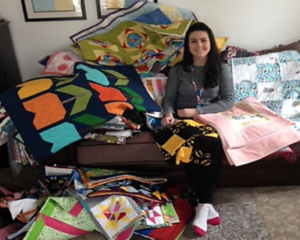 I am writing on behalf of my daughter and her husband as they are busy caring for their baby son at the moment but we wanted to acknowledge the kind act of the volunteer who made the quilt that staff at Edinburgh Sick Kid’s Hospital gave to their son. The recipient was my grandson, who was 4 weeks old when he was taken by ambulance to Edinburgh, from Dundee, as an emergency admission on the 26th December. 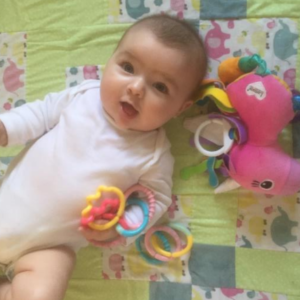 he had been ill for the 4 short weeks of his life, continually being presented to GP’s by my daughter only to be sent home after being told he was fine. he became increasingly weak and underweight as he was unable to keep any milk down. On Boxing day, he almost died when he started vomiting poo and, at long last, they discovered he had a strangulated hernia. 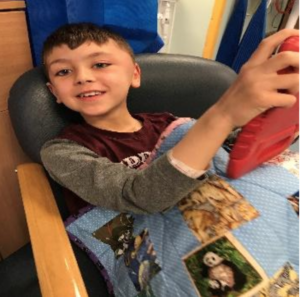 He was so weak and underweight though it was dangerous to operate and there followed an anxious wait in Edinburgh until he could gather enough strength to be operated on. I’m very glad to say the operation went well and he is now home and is starting to gain weight and get stronger. The kind acts of your volunteers are so important when parents are feeling like their world is collapsing. 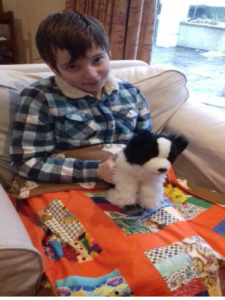 My grandson was too young to appreciate the gift but his parents certainly took comfort from the fact that there are people out there willing to give up their time for children who are ill. The quilt now takes pride of place in his nursery and, when he is old enough, he’ll be told the story of how that quilt came to be his. Please pass our thanks onto the volunteer who created it. 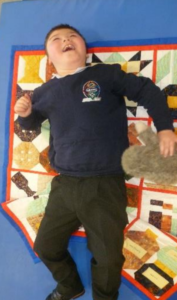 This is Rubén who, we’re told, absolutely loves his quilt. He attends All Sorts which is a support group for all disability groups within Gloucester County Council. 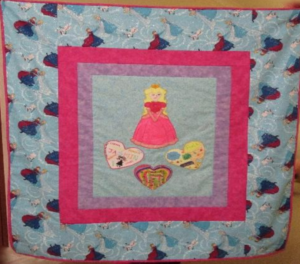 We take quilts to their meetings and the children can choose the one they want. We always enjoy reading Stitching Together and thought we should probably contribute a little paragraph and photo of our group’s activities. contribution towards the cost of heating and lighting from our “subs” of £2 a week per person which also covers the cost of tea, coffee and milk! 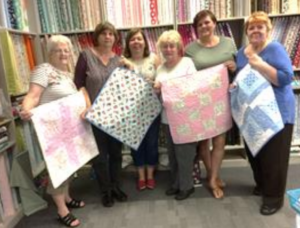 In the early years we had to buy our own fabric but over time we have been given quite a large stash of material and threads from other quilters who can no longer sew or from the sewing rooms of ladies who sadly passed away. In November we said goodbye to one of our members, Maureen Cloke, who was moving to Hereford to be nearer to her son and grandson. 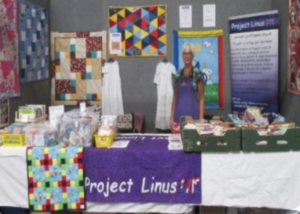 We are missing her and are hoping she finds a local Project Linus group to join soon. 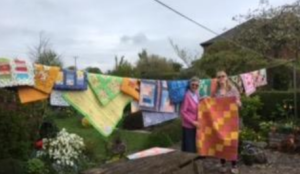 Although two of our group are registered as Co-ordinators we all decide where to send the quilts we’ve made ourselves or had donated to us by other local quilters, and then we all take part in delivering them. It’s a group effort! 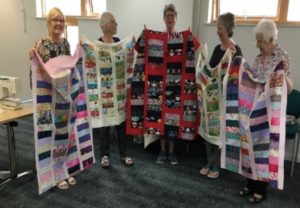 We love our Wednesdays – there’s always a lot of laughter while we catch up on who has been on holiday, whose central heating isn’t working, whose grandchildren are the funniest, what quilting exhibitions are coming up, etc! Our challenge for 2018 is to use up some of the more tricky coloured fabrics we have in the cupboard – waste not, want not! 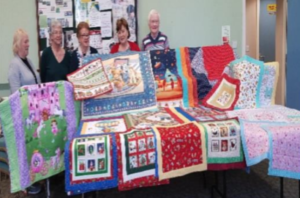 The ladies from Ballydougan Patchwork and Craft Group, and The Cosy Club from Birches who made quilts for Project Linus in 2017. 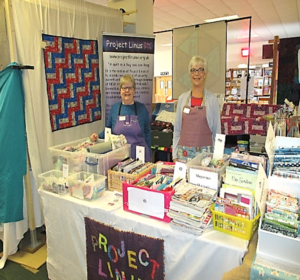 Both these groups make quilts on a regular basis for Project Linus in Northern Ireland. We have this week, received a letter of thanks from the Visitor Centre at Winson Green Prison thanking us for the contribution we make to the Christmas parties attended by the children of the Serving prisoners at HMP Winson Green. For many years my husband Tim and I have taken new and nearly new games, books and gifts for these children on behalf of St Michael’s Church Solihull. These are often the only present a child receives when their dad is given custodial sentence then their children also become disadvantaged with financial hardships and family break up and sometime foster care ensuing. 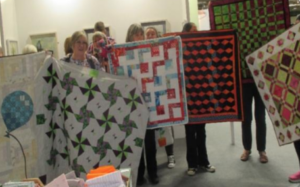 However, as of 2016 we also took gifts of quilts made by yourselves. These were warmly received. 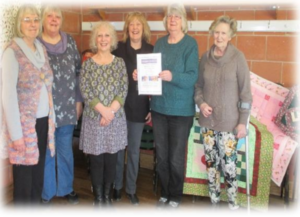 When we visited in 2017 and took yet another gift of quilts we found out just how wonderfully your hard work had been appreciated and the 90 quilts we took were greeted with grateful open arms. In some cases, the children arrive in the winter time wearing just a t-shirt or no warm clothing, and we were told that they are able to leave with a warm quilt which will be their very own. 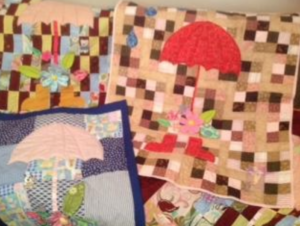 Hi Ann – Once again thank you for your quilts! Looking through some of the design, you have impressed me with the quality and creativity of the designs. You and your group are doing such great thing to help those who are less fortunate in life so keep up the good work. 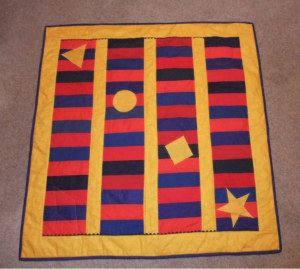 I thought I would also share with you a story about the blankets which you can share with your group. 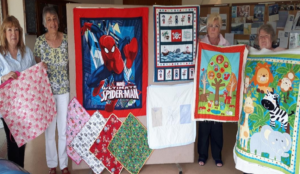 Here at Foster Care Agency we use the quilts which are kindly donated to put in our memory boxes for children and young people. Once a child or young person is placed in a foster home they receive a visit from me or a colleague where we take out a memory box for them to save precious items in. 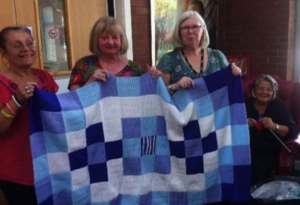 Recently I visited a 1 year old and in their memory box was one of the blankets which we collected previously. Our boxes also include other items such as colouring books, teddy bears, cards, blank paper etc. 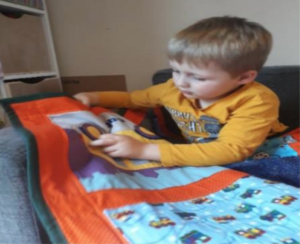 When I completed this visit however, the child was not one bit interested in any of the items other than the quilt which they pulled out of the box and started to cuddle. 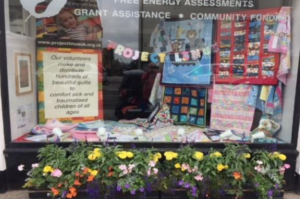 This child had come into placement with very little so for them to have something which was their own, I think was very important to them which to me highlights the importance of what you are doing and the need for your project to be promoted more so more children and young people can benefit from what you are doing. 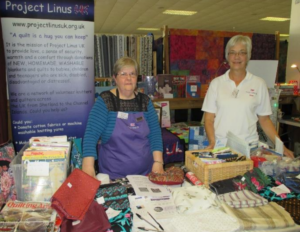 On the first Friday of each month a group of ladies get together at Morville, nr Bridgnorth and make tops for Project Linus. 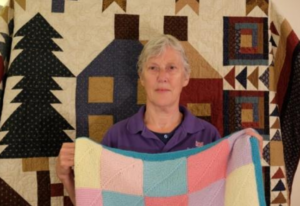 They are then handed to Ann Jermey who quilts them on her long arm quilter. Once quilted they are returned for binding. 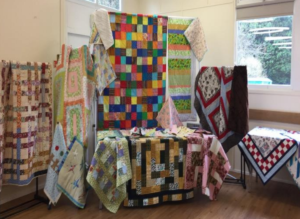 Whenever I can I join the ladies and every few months they hand over 30 – 50 quilts. 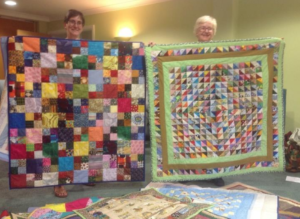 During 2014-2015 they made 212 quilts and I presented them with their first Achievement Award. 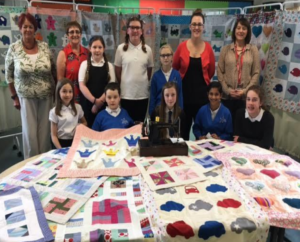 Between 2016-2017 they exceeded this number and made 239 quilts and in February I presented them with their second Achievement Award.